Cats are very curious creatures. Just when you think you have them figured out, they do something that blows your mind! Check out Mao, the cat! At first, he is only slightly curious about the oblong, yellow banana – but it doesn’t take him long to go bonkers of the fruit and move in for a taste! He didn’t just lick the banana – he went (wait for it…) he went bananas and actually started to gnaw on it! It may surprise you to know that Mao isn’t’ the only cat who likes to munch on bananas! Check out this Persian (with a fashionable hat) chow down on a banana. Here is another ginger cat enjoying a banana! Watch the video below to see Mao go bananas for a banana! 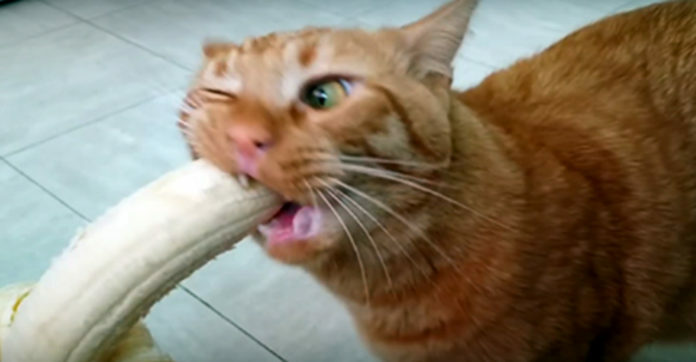 The ASPCA says it is safe for cats to eat a peeled banana. The health benefits that felines may gain from this snack are still unknown.